For each team this can vary depending on the experience level aboard – but for most teams it is about 20 knots of wind and above – especially in open unprotected water when the seas have a chance to build and are influenced by the current. Be prepared – get psyched!! If you don’t like like light air – practice in it as much as you can – the same can be said of heavy air – particularly downwind – go out with your lifejackets on, the rig tightened to the max setting required by the tuning guide and your old sails and go sail in it! It’s important to change your mind set to a positive one for the given conditions, try and avoid talking yourself out of doing well just because the wind isn’t ideal for you. It’s really important to go over every piece of rigging on the boat – every pin and ring ding- if a halyard or sheet is worn – don’t risk it – replace it. I remember one heavy air J24 World Championship day sailing with Jeff Johnstone of J Boats – we put safety lines on the outhaul, spinnaker ratchet blocks as backups in case they blew up – you can never be too prepared and it paid dividends. Talk with your team also on the risk management involved with deciding to set the spinnaker or not – there may be a case not too if it is really howling with big seas, more on that later. What i have seen time again is the importance of getting around the course clean and in one peace – generally if you can do this with no broaches, gear failure or other incidents you can finish in the top half of the fleet just based on those things. It can be a classic war of attrition out there! Lets look at sailing dead downwind, (or as low as possible on a windward/ leeward course) with a symmetric spinnaker, most if not all of the key elements apply to an Asymmetric spinnaker as well in this article . In a future article we will look at heavy air Asymmetric downwind sailing and also reaching with both symmetric and Asymmetric spinnakers. When rounding the weather mark keep everyone on the rail to keep the boat flat and be sure to ease the jib out a lot in tandem with the mainsail to keep the boat level. If you don’t the mainsail will flog and the boat will be driven straight sideways by the over trimmed jib! If it is very windy then a good idea is to ease the vang an inch or two as you approach the weather mark – this twists off the leech of the mainsail and helps the boat bear away. If you don’t do this on some boats the boat will simply not bear away even though the Mainsail is completely eased out! If you are sailing to an offset mark like we have typically been doing at bigger events and it is really windy then don’t bother setting the pole until you have rounded the offset mark – keep everyone on the rail as you are likely very overpowered and concentrate on trimming the sails well for max speed and control. If you can set the pole ok then make sure everyone hikes as hard as possible while the weight is on the rail. Shall we set and when? This is the big question!! If you are leading the fleet and it is blowing 30 knots with big waves then what we have done in the past is make sure we are on the correct /closest jibe to the mark, made sure the boat is flat and perfectly under control, set the pole and then watched our competition carefully to see how they are doing. Can they hold the sail up effectively or are they having difficulties? If they are doing fine then we set, if they don’t set then we don’t either as there is no need to risk anything. At one regatta when it was blowing 35 knots we watched two boats set behind us and just as we were thinking of matching them they both death rolled – one capsized, (they came up fairly quickly) and the other rounded up hard head to wind with the chute flogging wildly – seeing this we didn’t set and pulled away with our jib wing and wing on the closest jibe to the mark. 1) Make sure the boat is perfectly level and under control. 2) Don’t ease off the mainsail controls or the backstay or aft lowers if you have them – leave everything on as if you were going upwind – easing them is not going to help performance much and you will not have time to put them back on as the leeward mark will come right at you!! 3) Make sure you are on the correct headed jibe to the mark – a lot of team set, get on a plane, lose track of the mark and sail tons of extra distance, they can actually be beaten to the mark by teams that sail on the correct jibe and who sail very low with no spinnaker in 30 knots of wind! It’s a classic case of the tortoise beating the hare! 4) Set in a lull – not the biggest puff of the day! 5) Leave the small jib up with the sheet eased out, it’s one less thing to worry about and it helps stop the chute from hour glassing around the forestay. If you have the Genoa then the advice is to take it down when the boat is under control – don’t try pulling the sail down when the bow is submarining – get aft, wait for the boat to level out and then sneak forward and pull it down. The weight forward in a puff can cause the boat to round up as the rudder comes out of the water. 6) Keep the outboard end of the pole down a few inches from your normal setting – this will tighten the luff of the sail, pull the draft forward and spill the leech – make the analogy of the Cunningham on the mainsail which does a similar thing. I remember watching a past America’s cup final and it was interesting to note Alinghi would do this for max control and safety as Team NZ had retired with gear failure , the goal was to get around the course in one peace – that is very true in heavy air fleet sailing as well. 7) Make sure the windward and leeward twing’s are on tight so that the spinnaker is choked down. The trimmers should both sit down in 30 knots to help steady the boat and so they don’t fall down in a broach or roll. John Burnham makes this excellent point in Sailing World Magazine when reviewing the first J24 World’s in Newport in 1978. 8) Don’t set until the skipper say’s hoist and make sure everyone is in the correct position. 9) When the spinnaker fills – over trim the sheet to keep the sail in front of the boat and move the whole crew way back to get the bow out of the water and keep the rudder in the water! 10) Be ready to hike to leeward as the spinnaker will want to pull the boat hard to windward, an effective method to sail low is to have a number of crew on the leeward side to counteract the boats tendency to want to heel to weather in big lifting gusts, this can enable the skipper to sail low with more confidence. This is fun – whoops we are starting to roll!! 1) Skipper – steer the bow directly under the center seam of the spinnaker – if it yaws’s to windward- steered to windward, if it yaws to leeward – steer to leeward. This keeps you right under the sail for max balance. 2) Spin sheet trimmer – over trim the sheet on the spinnaker about a foot and a half to put the sail directly in front of the boat, hike out to leeward a little too if the skipper is sitting on the weather side to keep the boat balanced. Make sure both twings are hammered down to deck level to reduce the oscillating tendency of the sail to a minimum. 3) Guy trimmer – ready to ease the pole forward if the boat heels really hard to windward. 4) Mast – hike out to leeward to counter the weather heel – double-checking the downhaul on the pole is tight and the twings are cleated really well are good personal checklists. The Mast person needs to be double-checking everything and being able to back up the bow if needed in any situation. This boat handling versatility is a necessary ingredient of your teams make up – especially when it is very windy. 5) Bow – Call the puffs – hike out to leeward to counter the weather heel and have a hand on the tail end of the vang ready to release it if the boat starts to round up in to the wind. Otherwise make sure the vang is very tight so that the leech of the mainsail has power in it to counteract the power of the spinnaker to help dampen the rolling. A common misconception is to ease the vang downwind to depower the mainsail – this actually increase the rolling and can cause a death roll (Jibe broach to leeward or round up to windward) because there is a large inequity in balance between the mainsail and the overpowering spinnaker. As skipper bears away in a puff or the stern lifts on a wave and the bow goes down, (the apparent wind shifts forward) try pumping the mainsail and spinnaker sheet together – this will accentuate the apparent wind across the sails and promote / prolong a surf or plane. As the bow lifts and/ or the apparent wind shifts aft – ease the sheets back out. The limitation in the rules on this is you cannot pump more than once per wave or gust and planing or surfing conditions must exist. In the ideal world you would pump the spinnaker guy as well but this can be a little too much physically to do, as the boat is a borderline handful at this point! Pumping the sails when it is windy is a work out but the gains are tangible if it is done properly and with the right timing. If the boat rolls really badly to windward then ease the pole forward – this will put the spinnaker behind the mainsail and help you regain composure. We have done this in the big waves of windy regattas many times. The boat is heeling hard to weather and on the verge of jibing and broaching – we ease the pole forward and over trim the sheet to put the spinnaker behind the mainsail, in tandem with the skipper steering under the center seam – it saves the day! On days when the wind is very gusty with lulls followed by big blasts it’s very effective to play the leeward twing and the spinnaker sheet. For instance in the lull the trimmer will ease the sheet out and pit ( or person designated) will ease the leeward twing for max power and projection of the sail, the bow then spots a big gust and the pit or other designated crew member pulls the leeward twing line down and over trims the spinnaker sheet to keep the spinnaker and the boat steady and to dampen the rolling – in the subsequent lull the sheet and twing are eased out, the two are essentially a gas pedal. Be careful with the fore and aft weight placement as well – in a substantial lull move everyone forward to reduce drag. 1) Skipper pumps the helm to reattach flow on the rudder. 2) Trimmer eases the spinnaker sheet out – goes with a bigger curl in the luff to depower the sail. 3) Bow dumps the vang to depower the mainsail – keep calling the puffs! 4) Trimmer dumps the spinnaker sheet completely. Note: Don’t dump the guy off, as the spinnaker will blow out to leeward and have 5 times the heeling moment in it! 5) To recover – pump the helm and bear the boat off to a manageable broad reach heading, retrim the spinnaker sheet and then retrim the vang – off you go again. If you are pinned over – consider blowing the spin halyard, this very often rights the boat on a bad knockdown. 1) In a substantial lull – if available! 2) On the top of a wave – this enables the boat to be jibed going down the wave with minimum pressure on the sails. 3) When the boat is planing – this is a great time as there is very little pressure on the sails and the main and spinnaker pole can be jibed easily. 1) The skipper steering the bow under the center seam of the spinnaker and using very little rudder. The skipper or main trimmer should also trim the mainsail in at least half way prior to the jibe – this allows the boat to be jibed with less rudder, as the wind has to travel a lot less distance around the leech to jibe the sail. When it is really blowing we have had the trimmer jibe the mainsail across so the skipper can focus just on steering – this one takes practice and co ordination. 2) The trimmer keeping the spinnaker chocked down with the sheet and twinged down to reduce oscillation to a minimum. 3) Every one is ready and on the same page! 4) If there are big waves then a technique you can use on the bow to jibe the pole is to jibe the spinnaker pole with the roll of the boat in a wave. The pole would be jibed across as normal – and then as the last part of pushing the pole out may be somewhat difficult, (blowing 30 knots) , the trick is to wait for the boat to heel to windward and then push it out and be able to make it easily on the inboard end. Like so many aspects of life – a little patience can be the key! Broaches or bad jibes usually occur because of over steering, not being able to jibe the mainsail, jibing in the trough of a wave or with the spinnaker too eased out. Jibing in the biggest blast and shift of the run doesn’t help either! The trick is for the skipper not to sail too dead downwind as this can cause a major hourglass in the sail and for the trimmer to keep the spinnaker slightly overtimmed to keep it as steady as possible. Once the bow person has jibed the pole the cockpit trimmer can jibe the jib across (the leech of the jib has been wandering back and forth across the centerline fairly eased out to enable the pole to be jibed) and cleat the jib sheet on the leeward winch. If you experience a bad hourglass in the sail because the boat has been held by the lee too much then jibe the mainsail back and the reverse flow off the sail will unwrap the spinnaker – seeing it in practice tends to make believers of that technique! A very conservative- and very often very effective approach is to take the spinnaker down to windward, store the pole, jibe the main and jib, reset the pole and if the conditions are right – reset the spinnaker. This can be a great move if it is just too much wind to jibe in or the risk/ reward formula is a poor one for your team. This also works particularly well on short downwind legs when the team risks flying by the leeward mark trying to find the right time/ courage to jibe! If it is very windy – 25 to 35 knots plus – we have found it very effective – particularly in big waves to wing the jib out and sail as low as we can to the mark. Pumping the mainsail once per wave or puff helps accentuate a surf/ plane. There will be some teams who can hold the spinnaker very well, but a large number will be struggling – this tactic can work well when your goal is to get around the course clean with no breakdowns and the crew and spinnaker in one piece, (the crew always hope that is one of the goals!) and a solid respectable finish added to your score line. With the war of attrition in a long series or with no throw outs – this can be an effective tactic for moving up the standings. In one heavy air J24 race I was in the whole fleet was caught out with Genoa’s in a 25 to 30 knot squall with just the downwind leg to go – we found it very effective to wing the Genoa out using the spinnaker pole. The boat sailed low and fast to the finish and we got there in great shape amidst the chaos around us! Heavy air Dousing: Try the “Halyard drop”! Get the spinnaker down very very early – much earlier than you think! Can’t emphasis this one enough. Budget lots of time to hoist the headsail, store the pole and douse the sail and get cleaned up. 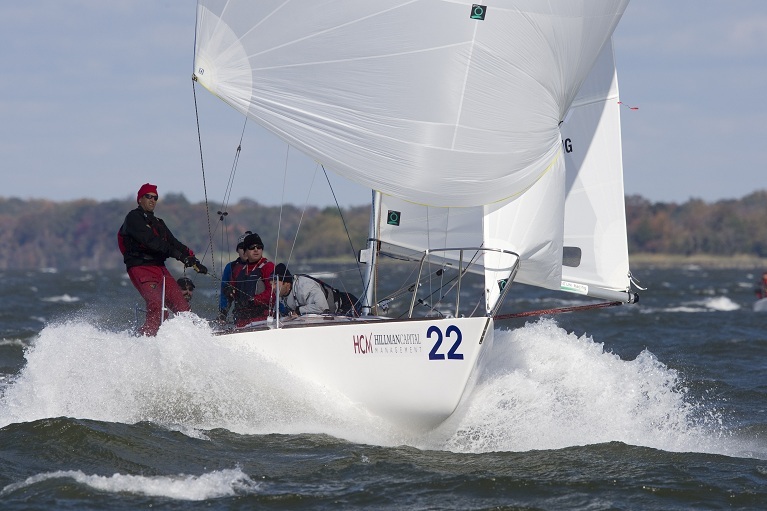 The “halyard drop” takedown works great for leeward takedowns, takedowns on a reaching angle (dousing to leeward) or for the last takedown of the race when the spinnaker can come down on either side if necessary for the conditions. It’s a good one to add to your repertoire of takedowns. Ease the guy forward to the forestay with the sheet tight and then blow the spinnaker halyard right off – the spinnaker will float out to leeward and can be gathered in easily at the foot. Once the foot is under control – overhaul the guy and the spinnaker will be in the cabin very quickly. Then take down and store the pole. The benefit of this is it keep the spinnaker close to the boat and reduces the heeling moment the sail can generate, it also enables the crew to stay on the high side if necessary as well. A conventional leeward takedown of overhauling the guy can very often broach the boat badly as the spinnaker goes way out to leeward and tips the boat right over. KABLAM! It produces the type of picture you see in Sailing calendars! Getting around the mark clean with everyone on the rail and ready to go upwind will give big tangible gains on teams that don’t. Typically you choreograph this so everyone is max hiking as you go around the mark. If the team isn’t max hiking the boat will heel over and go straight side ways. You need to budget time accordingly to do this so that you can come around the mark , it is critical for the leeward mark rounding. With a very firm luff tension with the draft pulled forward to provide a more forgiving shape and wider groove of steering in the heavy air your team will be ablke to hold there lane longer as you look to get away from the leeward mark. When you see teams come around the leeward mark in heavy air with scallops in the luff of the Jib/ Genoa you know the skipper is having a hard time steering with a tight groove to work with and the draft too far aft in the sail, this team usually sags and loses there lane and is forced to tack away. Like any skill there is no substitute for practice, heavy air is very much a big test of your teams boat handling and it’s ability to work together in the challenging situations that can be presented. Your decisions on how you tackle the heavy air downwind leg will typically be a function of how much experience the team has and how comfortable your team feels with the conditions. Methodical boat preparation and generally conservative tactics with a solid backing in the fundamentals will produce consistency in a series that will help the team realize it’s overall potential in these challenging conditions. Great article, gives the full range of actions in a blow and has a nice emphasis on keeping under control.